Enjoy your stay at La Plage Resort, wellness hotel in Taormina. Overlooking the bay of Isola Bella, immersed in a true natural paradise, a new oasis of beauty has born, the Expure SPA, wellness hotel in Taormina. It is an exclusive ambience where our guests can rebalance their own physical and mental well-being. Surrounded by an atmosphere of fresh fragrances and relaxing sounds, you are bound to forget the fast-pace of the city, the stress or the fatigue of your journey, let us take care of you, and all your senses will be ravished by the style and the functionality of our spa. A new generation cosmetic chemistry that help our guests to take care of themselves in a natural way. 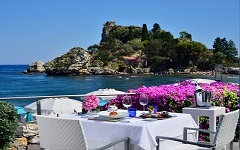 La Plage Resort, wellness hotel in Taormina, is located on a stretch of paradise on one of the most exclusive beaches of Taormina in front of Isola Bella, a beautiful island protected as a nature reserve. Taormina is considered an important Sicilian and international tourist resort, and for this reason a must for cultural appointments. Taormina's millennium history, its past civilizations, the sea and its monuments have centred Sicily's tourism in this area. It's perfect for all seasons. Ideal for vacationers who love being in direct contact with nature and its peacefulness or vacationers who desire physical activities, emotions and new encounters.